Spacious, light, 4 bedrooms, sleeps 8 + baby. Sat TV. Free wifi. Private pool. "We are loving our stay here, the most beautiful place. I think the sunflowers may come out while we are here." Stephen & Charlotte A. A beautifully restored, peaceful, spacious, light & airy farmhouse with white walls, exposed beams, lots of character, with all mod cons including unlimited broadband internet use (Free WiFi). GROUND FLOOR - open plan with cool terracotta floors, large living area with comfy sofas, coffee table, satellite TV & wood burner, dining area with table & chairs for 8, spacious modern kitchen with dishwasher, tall fridge (with freezer part), microwave, utility room with washing machine, shower room/WC. Private rear terrace with garden furniture & BBQ for alfresco dining & watching sunsets & truly amazing star gazing. It's awesome free entertainment just watching the heavens at night, or perhaps taking a midnight dip in the floodlit pool. FIRST FLOOR - 4 attractively presented double bedrooms, one with en-suite shower room & WC, and a family bathroom & WC. All bedrooms have exposed beams, a chest of drawers with mirror, and either a wardrobe or hanging space. Bedroom 4 also doubles as the study with a desk if required. All bedrooms enjoy wonderful countryside views too. In fact you can watch the sunset from the double bed in the master bedroom. OUTSIDE - there are panoramic countryside views all around the 0.5 acres of lawned flat gardens - ideal for a game of boules - plus private parking area, also shrubs & some trees for shade. The private pool measures 10m x 5m with a safety alarm & sun loungers. ACTIVITIES/SPORTS/SIGHTSEEING - there is so much to discover, something for everybody. People say a fortnight is not enough! NEW! - THEMED HOLIDAYS arranged for you. Walking, cycling, birdwatching, photography, painting, tennis, golf, riding, wine tasting, cooking, learning French, spa days, yoga. Others by arrangement. Please ask. GOLF - from the terrace at Les Etangs you can see the red roofs of Le Manoir de Longeveau across the fields. It's about a 5 minute drive. This is an English run country club with a 9 hole Golf course with regular competitions, 3 hard TENNIS courts (coaching available), and a lively social calendar of barbecues, concerts & events throughout the year, open to non-members, at their delightful outdoor terrace & newly refurbished stylish bar/restaurant with panoramic views. Definitely worth a visit or two! There are 18 hole golf courses at Angouleme (45kms) and Périgueux (50kms) and further afield at Cognac, Royan & Bordeaux. For kiddies there is MINI GOLF at St. Severin, just 1km from the house. Nearest TENNIS court is at St. Séverin (1km) & there are 3 tennis courts at Le Manoir de Longeveau (3kms) & more at Aubeterre (6kms) in a riverside setting. There is a safe & sandy RIVER BEACH at Aubeterre with kids' PLAYGROUND. In summer there is JOUSTING on the river. Or you can take a lazy CANOE trip downriver, be collected & brought back to your car. MOULIN DE POLTROT (3kms) nature reserve, with riverside activity areas, including rope bridges, TREETOP CLIMBING ADVENTURE (a real hit! ), a maze, children's playground (fenced), snackbar in summer, picnic and bbq areas. HORSE RIDING is available in Bors (6kms) & just outside Aubeterre & at Bonnes (about 8kms). At Les Etangs, you're on the borders of the DORDOGNE department, so it's an easy drive to all the sites & attractions of this famous area of France - magnificent CHATEAUX, prehistoric caves, bastide towns & medieval villages in the area from Bergerac to Sarlat. In the other direction are the great VINEYARDS of Bordeaux & Cognac, with ample opportunity for WINE & Pineau TASTINGS. St. Emilion (a UNESCO world heritage site) is another must see - one of my favourite places. Love it! Local FARMS are often also open to visitors with tastings of local produce, foie gras, walnut oils etc. The sandy BEACHES of the Atlantic COAST (around Royan) are about 90 min. drive - another great day out. Locally, there's AUBETERRE (6kms) a superb listed medieval hillside village, with a RIVER BEACH & kiddies playground. Plus FISHING (permits available). There are winding streets with small craft shops & galleries & a gorgeous shady square in which to idle over a few drinks or a lazy lunch or dinner, or browse at the Sunday market. It's one of my favourite places to linger........There is a great choice of restaurants too catering for all tastes. In summer, spot the many posters for MUSIC evenings, concerts & EVENTS in the square or down by the river, including river jousting! CANOEING is available on the river in Aubeterre & HORSE RIDING is about 1km outside Aubeterre. There are also many historic buildings including the 11th century monolithic church & Romanesque Eglise St. Jacques. SPA days (or half days) & BEAUTY TREATMENTS are available at Hostellerie du Périgord in Aubeterre. There's YOGA available too at Juignac (about 6kms). Aubeterre has a wonderful character all of its own. It's a MUST SEE. After all that activity - or instead of - just chill out by the pool with a smooth glass of wine & a great book. And after sunset (if you're still there on the terrace) try a little STAR GAZING. Just watch the stars come out to create a jewelled canopy above you. Truly magnificent. There is little light pollution so it is all the more spectacular. Margarete and (late husband) John Isherwood, purchased Les Etangs in 2002 as an original old stone barn of just four walls and a roof. John was a construction engineer and (amateur but talented) watercolour artist who had been developing old barns in SW France since 1990 until his untimely death in 2005 at the age of 54 (RIP). As it turned out Les Etangs was his last hurrah, and Margarete keeps it going as a tribute to John, but also because she loves it there too. It's such a peaceful, restful place. Location, location, location with its unbeatable panoramic views over gentle rolling countryside, fantastic if it's a year for sunflowers all around. Also for the TOTAL peace and quiet, which is so hard to find these days, so it's the perfect place to relax and unwind fully, whilst being only 1km from the nearest small town of St. Séverin which has all basic amenities. Plus, there's so much to see and do within easy reach. 3 sparkling bath/shower rooms Upstairs - family bathroom with white bathroom suite, with full size bath with shower over, basin & WC. Nice views over countryside. Master bedroom has an en-suite shower room with white suite, shower, basin & WC. Downstairs - shower room with white suite, shower, basin & WC, handy for coming in from the pool. Adjacent is the utility area with washing machine, washing basket, pegs, iron & ironing board. The property is quietly located at the end of a lane, with panoramic countryside views all around. If it's a year for sunflowers in the fields around the house, it's a magnificent sight. Nearest village is St. Séverin, about 1kms, with small shops, bakery, small Spar supermarket, abank, post office, a few restaurants & bars, plus mini-golf, a tennis court and a football field. There are a few small rivers in the area, but the main one is the River Dronne at Aubeterre (5kms) with riverside beach and canoeing. There's also a children's playground, tennis courts, campsite. There are wall mounted electric radiators in each room, including main bathroom. Separate utility room with automatic front loading washing machine, washing basket, clothes drying rack, outdoor washing line between the trees, pegs, iron & ironing board. New live box in March 2018 from Orange, with good signal. Free wifi during your holiday. Bath towels and hand towels are provided, but not pool towels, as a rule. But if this is a problem for you, please ask. Woodburner for cosy evenings in low season. Wood can be supplied by arrangement. Cooker with 3 gas rings and one electric ring. There are usually dry goods, condiments, teabags, oil, vinegar, pasta etc. and some sauces available. GROCERIES ON ARRIVAL can be arranged. Please ask for details. Fully equipped for 8 people with ample crockery, cutlery and utensils. Light, modern, fully equipped, with tall fridge (and large freezer compartment), dishwasher, gas hob, electric oven, micro wave oven, electric kettle, toaster and coffee maker. Large beechwood dining table seating 8 people on 8 wooden chairs with chair cushions. There is an extra table extension piece that can be added if required. Lovely views over the countryside. There is a DVD player with a dozen or so DVDs to choose from, but not enough to call it a DVD library! There is a selection of (mostly) English books in the living room and (most) bedrooms. Some French books. Also a selection of English & French magazines. Trivial Pursuit, Scrabble, Dominoes, jigsaws, badminton set, 2 boules sets , various bats & balls. Canoeing on the river Dronne (5mins drive away). It's great fun! NEW! Local BIKE HIRE is now available by arrangement. Delivered to your gite door. As many bikes as you required. No need to bring your own. Details on request. 5 mins away at Manoir de Longeveau (3 courts) or at Aubeterre (3 courts). Also at St. Séverin (2 mins) with 1 court. Private pool 10m x 5m with panoramic views. Pool depth is 1.2m to 2m. Ladder-style entry into the pool and a paved area around it for sunloungers (with cushions). Pool alarm as required by law. We had stayed in the local area over many years, but never in this particular part. It was lovely to be so close to Aubeterre which we visited a couple of times in our trip. The house is clean and modern and very well equipped. It is deceptively spacious too. We were there in September, after the sunflowers had gone, so it would have probably been even nicer when they are out. We did find it rather windy (again the sunflowers may have shielded this). The weather was pleasant though not really warm enough to spend a lot of time in the pool! The house is located about a 20 minute walk from the nearest village, which is probably our only real criticism - it would have been nice to be able to wander in more frequently. The house is semi-detached and we had neighbours for part of our stay, but there isn't any noise transfer between the houses, so it feels fairly private. Loved our stay as extended family. House large, welcoming and clean. House was very clean, comfortable and exactly as described, with everything we needed for a great holiday. The location is in beautiful countryside, and was perfect as a base for discovering the many beautiful towns of the Charente and Dordogne regions - we had wonderful day trips to Saint Emilion, Bergerac, Angouleme and Brantôme, and Aubeterre (officially classed as one of the most beautiful villages of France) is right on the doorstep. We had a wonderful week at Les Etangs, and I would thoroughly recommend this property. Many thanks. Glad you enjoyed your stay at Les Etangs! The property is located just outside St Severin but close enough to nip to the shops. 5 mins up the road is Aubeterre which is beautiful. We recommend the market on a Sunday and also the underground church is intetesting. The river beach is a wonderful location to swim and play all sorts of recreations such volleyball, bowls etc. One tip is take your own drinks as they are expensive at the cafe. The house is clean and has everything you need for a large group. Three showers was very helpful. The kitchen has all the utensils and the bar b que is large enough for a big group. The property comes into its own from 4 o'clock where the sun shines on the back of the house, the children had plenty of space to run around and the adults can sit out and watch the sun go down. The pool is nice and clean and alarmed which is good for families. The weather does get windy so make sure your lilo's are weighted down. I was seen rescuing a unicorn from 2 fields away !! Thanks for very useful feedback. Just to say there's plenty of sunshine on the garden throughout the day, with different areas in shade as the sun moves round. 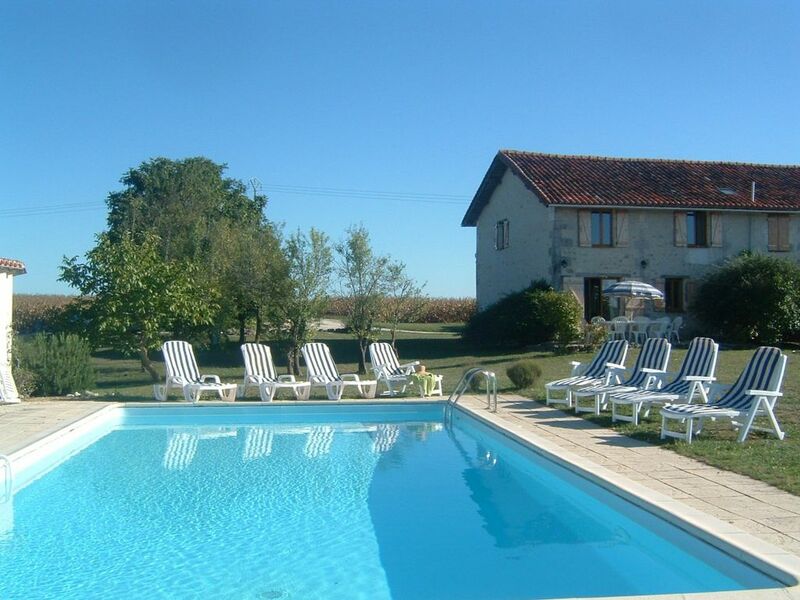 Beautiful gite and grounds with stunning views. We loved our stay at Les Etangs to the point where we didnt want to come home!. It is in a beautiful setting and anyone wanting a totally relaxing holiday this is the place to come. It is a 20 min walk to the village of St Severin where you have all the amenities that you require. The property was spotless and well maintained. Margarete, the owner was amazing - organising a surprise birthday cake for my husband and bottles of fizz. Having the pool was an added bonus. I would recommend this gite for anyone wanting a relaxing holiday in beautiful and peaceful surroundings. Many thanks. Always good to hear a holiday at Les Etangs lived up to expectations. The local boulangerie/patisserie is well renowned for making great cakes, so any more birthdays coming up at Les Etangs just let us know and we can arrange it for you. A very good and well appointed holiday home for those who want complete quiet and relaxation. Not too deep a pool either for those of us less confident swimmers ! Located about 1hr from airports at Bergerac, Bordeaux or Angouleme, in peaceful countryside, just 1km from the small town of St. Séverin (on the edge of the Dordogne) with all amenities, bakery, small Spar supermarket, bar, restaurant, bank (ATM), doctor, dentist, tennis, mini golf etc. 5kms from Aubeterre (listed medieval hillside village) with river beach, canoeing, playground, craft shops, restaurants & cafés. Sit in the leafy square with a cool drink & watch the world go by or amble round the small Sunday morning market. Don't miss the summer puppet theatre! Nearby Longeveau golf & country club is a delight, while Friday's Ribérac market is a must. Beautiful Brantome, known as the Venice of the Périgord (Dordogne), Bergerac & Périgueux are others. Further afield are the famous châteaux & sites of the Dordogne. And the great vineyards around Bordeaux. Great restaurants abound in this area, famous for foie gras, truffles & walnuts. The stunning scenery makes it an artist's paradise too with many small galleries. So much to enjoy, a fortnight may not be long enough! Other Activities: Poltrot treetop climbing adventure and riverside nature park (3 mins), a huge hit with kids on holiday at my house. Périgueux(18 Holes) about 45 min. Angouleme (18 holes) about 45 min. Chateau de Vigiers (18 holes) about 60 min. From Sept. to April/May, rental rates and minimum stay are flexible according to availability and number or people in your party. Please contact us with your requirements. Payment schedule is 25% with booking to secure your dates. Booking is confirmed when 25% deposit is received by bank transfer or cleared cheque. 25% payable 12 weeks in advance of arrival 50% payable 8 weeks before arrival Breakage deposit £150 payable 8 weeks before arrival. EXTRAS - end of stay cleaning service £60 payable 8 weeks in advance of arrival - leave without cleaning! But house should be left TIDY, items returned to their place etc. to avoid extra cleaning charges being deducted from breakage deposit. SECURITY DEPOSIT - £150 per booking, from which any damage or breakages or telephone charges are deducted before return to you. INCLUDED - full use of the house, grounds & pool as described, FREE WI-FI, bed linen & bath/hand/tea towels, pool & garden maintenance, gas & electricity in high & mid season, car parking & rubbish collection. Plus, welcome bottle of wine. EXCLUDED - pool towels, travel, insurance, electric heating & wood in low/mid season. EXTRAS - please contact us with your requirements a) arrival groceries/provisions, 20Euros + cost of provisions b) celebration/birthday cakes, 20Euros + cost of home made cake from local bakery at St. Séverin (1km) - they are good! c) champagne and chocolates, 20Euros + cost of items d) flowers, 20Euros + cost of flowers e) baby cot, £10 per stay (we have 1 available) e) high chair, £10 per stay (we have 2 available) d) bike hire can be arranged RETURN OF BREAKAGE DEPOSIT - subject to our terms and conditions i.e. may take up to 8-12 weeks to allow for itemised landline phone bill to arrive. Please contact us with any further requirements and we will try our best to accommodate you.